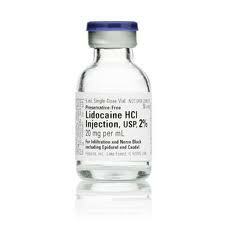 Rarely, a patient presents with a history of being allergic to lidocaine or another kind of local anesthetic. Often, the "allergic" reaction described (racing heart, light-headed, dizziness, etc) is more attributable to the epinephrine which is often used in conjunction with the anesthetic; therefore not a true allergy, but a not unexpected possible side effect. Also, if a true allergy is present, it may not be to the anesthetic itself, but the preservative contained within, typically metabisulfite and/or methylparaben. The exception are single-dose vials which are preservative-free, unless they contain epinephrine. Any local anesthetic containing epinephrine, whether a single-dose or multi-dose vial, has metabisulfite in it. The preservative in the multi-dose vial of lidocaine and other anesthetics typically contain methylparaben. As such, the muti-dose vial of lidocaine with epinephrine would contain both metabisulfite and methylparaben. In any case, if a true allergy to the anesthetic itself is present, there is the possibility that another type of anesthetic can be used. Why? There are two different classes of local anesthetics divided into amino esters and amino amides. Chemically, amino amides have an amide link between the intermediate chain and the aromatic end, whereas amino esters have an ester link between the intermediate chain and the aromatic end. There are other differences. Pharmacologically, amino esters are metabolized in the plasma whereas amino amides are metabolized in the liver. Amino esters are unstable in solution, but amino amides are very stable in solution. Amino esters are also much more likely than amino amides to cause allergic hypersensitivity reactions. * is next to those commonly carried in hospitals. Much appreciate the assistance of Margaret Rowe, PharmD who helped write this blog article.